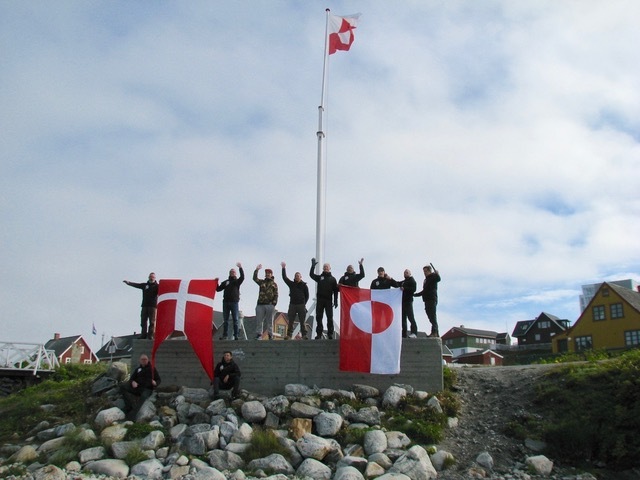 Veteranprojekt Grønland’ was given the honour of carrying the Danish Baton to Greenland during September this year, the project is a locally based with strong relations to the Danish Royal Life Guards and the Danish YMCA veterans’ facility at the regimental barracks. The project itself is two-stringed. Firstly, it intends to create a temporary recreational space for the participating veterans. Secondly, it supports the creation of a network for approx 92 veterans currently living in Greenland. All this because the significance of recreational activities as well as the existence of veteran networks are both are considered particularly important for veterans in need. ‘Veteranprojekt Grønland’ received the Danish Baton as a much appreciated encouragement and carried it to Greenland as promised both by hand and by heart. On the 5th of September the project took part in the Danish National Veterans Day’ celebration at the Joint Arctic Command HQ in Nuuk. During the celebration the project did, on behalf of Danish custodian Maria, pass the Danish Baton to ‘Veterancafé Nuuk’ a new initiative to create a veterans network in Greenland. Hence the Danish Baton travelled to Greenland ‘twice’.